If you are looking for a bangles that is neither too loud nor too sober in looks, then this maroon and green colored slipon bangles from the house of Aishwarya would serve your purpose. 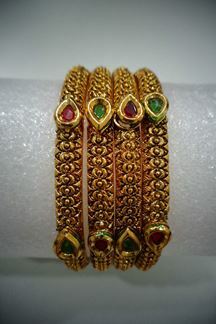 Intricately designed by experts, these bangles are embellished with stones and are perfect to make you look like a diva. Made of 22kt gold polish, wear it with your evening attire to complete the look. Note: Please note that the Free Shipping offer doesn't apply to any products purchased under the Accessories Section. Shipping charges will apply. Shipping charges will be waived off only if the product is bought along with any product under the following categories - Sarees/Lehengas/Suits/Gown/Kurtis.